New Castle County: "Safe and Inclusive Community"
President Trump and his followers’ anti-immigrant rhetoric has instilled fear in immigrant communities throughout the country. Across Delaware, immigrants—documented and undocumented—have avoided encounters with law enforcement and withdrawn from community activities and even necessary services like health care. Not only do Trump’s deportation plans threaten immigrants, they endanger the entire community. Regardless of personal legal status, immigrants are less likely to report crimes out of fear that they or their family members will be questioned, detained or even deported. As residents of New Castle County, immigrants have rights to the public services the community provides, but Trump’s deportation campaign isolates immigrants by threatening their livelihood and uprooting families across the state and nationwide. In order to address these problems, New Castle County Executive Matt Meyer signed the “Safe and Inclusive Communities” Executive Order on Wednesday, May 24, 2017. The order reaffirms that the county police’s role is to keep the community safe by enforcing state and county criminal laws, not federal immigration laws, and to ensure that the community provides equal services and opportunities to everyone regardless of immigration status. 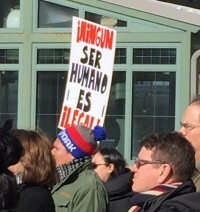 Under this order, county officers and employees may not stop, question, search, or arrest anyone because of their immigration status, participate in joint immigration enforcement with federal authorities, ask about immigration status unless required by state or federal law, or deny county-funded services to those who are entitled to them. Official actions like this one to protect Delaware’s interests in safe communities and non-discrimination benefit not only immigrants, but the entire community. When residents trust and work with law enforcement, law enforcement can work most effectively to protect everyone. Meyer’s order is not a statement of opposition to federal immigration policy. Instead, it is a recognition of the separate and independent purpose of our local government and law enforcement, which is to keep all members of our community safe. Other state officials should follow Meyer’s lead and preserve the roles of our state and local law enforcement agencies as bulwarks against crime and not deputies for a broken immigration system. The ACLU-DE has urged Governor John Carney to update Delaware’s state policy on immigration in light of Trump’s radical expansion of deportation efforts. By enacting this order, County Executive Matt Meyer is taking steps to ensure safety to all the members of the New Castle County community and remind people that the local government is an entity meant to help, not threaten, the people. Newark Passes "Welcoming City Resolution"
On Monday, December 11, 2017, city officials passed a resolution to "welcome, protect and defend all residents by making Newark a welcoming city." This resolution vows to protect residents' personal information, restrict the use of city resources for investigating individuals based on immigration status, and conduct training to implement the resolution city-wide. Recommendations from ACLU-DE and Network Delaware were used to draft this proposal, based on the work both organizations did with New Castle County's “Safe and Inclusive Communities” earlier this year. To read the full resolution, click here. This is another vital step to make sure that Delaware is a safe and protected state for all, but our work isn't done yet! State-wide inclusive policies will save money and resources, enhance public safety and help ensure that all Delawareans are treated with basic human decency. It is time for Governor Carney to defend the Constitution and our values against harmful immigration policies. Commit to oppose any effort by immigration officials to obtain bulk information from Delaware databases. Read our last newsletter of the year!